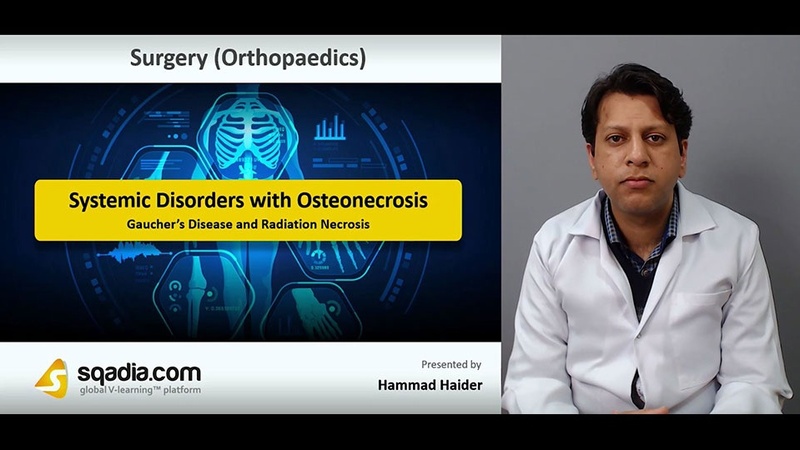 This lecture targets at discussing about the Systemic Disorders with Osteonecrosis. The main focus of section one is the Sickle Cell Disease. The educator instigated by elucidating Drug Induced Necrosis followed by an overview of what Sickle-Cell Disease is. In addition to this, a special analysis of Epidemiology and Incidence rate of this condition has been carried out. Moreover, Cause and Clinical Feature has been extensively talked about. In the end, the educator concludes by speaking about Imaging and the Treatment of this malady. Section two accommodates Caisson Disease and Dysbaric Osteonecrosis. In the beginning, there is an outline describing what Caisson Disease and Dysbaric Osteonecrosis means. Later on, the educator explains comprehensively the Mechanism and Consequences involved. Moreover, Symptoms of Decompression Sickness alongside Radiology and Clinical and X-ray Features has been thoroughly brought into consideration. In the end, the educator has summed up this section by laying emphasis on the Management aspect. The prime focus of section three is the Gaucher’s Disease and Radiation Necrosis. Firstly, the educator has defined an ailment termed as Gaucher’s Disease. Subsequently, X-ray and Treatment has been shed light on. Besides this, Radiation Necrosis and disease Pathology has been considered. Moving further, Clinical Features has been brought into consideration. The section concludes when the educator addresses about X-ray and Treatment, meticulously. The focal point of section four is Osteochondritis. The educator started off by describing a condition entitled Osteochondrosis (Osteochondritis). Furthermore, there is a detailed discussion on the disease Pathogenesis. Further ahead, the educator explains about Clinical Presentation, Imaging for this disorder besides a mention of the Treatment. In the end, the educator elaborates another state called Spontaneous Osteonecrosis of Knee (SONK). Section five is designated to take an account of Bone Marrow Oedema Syndrome. Firstly, the educator reports about Bone Marrow Oedema Syndrome. Secondly, there is a reference to disease Aetiology and Aetiological Pathway. In addition to this, MRI has also been contemplated. Conclusively, the educator delineates about the Differences between Transient Bone Ma, in tabular form.